Some people suggested Streisand get a nose job. She refused not wanting to risk changing her sound. Some people suggest Dolly get a breast reduction. " They're to offensive." She's refused. Barbara, Dolly & the Griso (Siamese exhaust & bread box oil cooler) have recognizable traits that set them apart. IMO a bikes full worth is stock full circle. So, farkle it so that you can re-oem it at sell or trade time. I like'em. I'd like to have one. Wouldn't change much. Central Kentucky Motorsports in Lexington has an '09 w/5,570 miles for $6,999. Rollerized? Dunno. IMHO its one of the most unique exhaust cans that I've ever seen on a bike, sounds pretty good too. I left mine in place, its part of the Griso uniqueness. It's perfect. Any change is not for the better. Actually I think "Dolly" had a reduction.......... ... lol. I agree, the 8V can is very unique. If you are happy man, keep rolling! I swapped out the stock can on my 4V for an Agostini Hydroformed pipe, grabbed it off Craigslist for a steal. That and an updated Beetle Map (had one with the stock can too) really improved the race to the top (quicker engine reving) and maybe a bit stronger top to middle end. Accidentally bounced it off the rev limiter on first run. Same happened with the Norge when I removed the Colostomy bag. Both gains were probably from removing the cat. I think most upgrade for the sound and looks, and appreciate the small gains from less weight and marginally better performance. I know I would love to put an Ipoythis (or how ever you spell it) Exhaust. 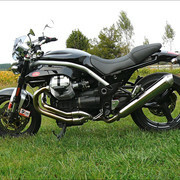 The twin pipes really match the look of the Griso. But i'm too cheap....... Short of that, I like the HF pipe, but will say few others catch my eye. YES!! And another vote for Dr.Evil and mini-me ! The stock pipe works well. If you like it? No reason to change. I also tried the Termi (because I really like the looks). I did not like the sound at all. Not so deep and more aggressive and more throaty. The ones that comes closest to the original exhaust seems to be my 2-1 BOS from Däs-Mototec. I find the Griso exhaust too large and grossly overstyled. 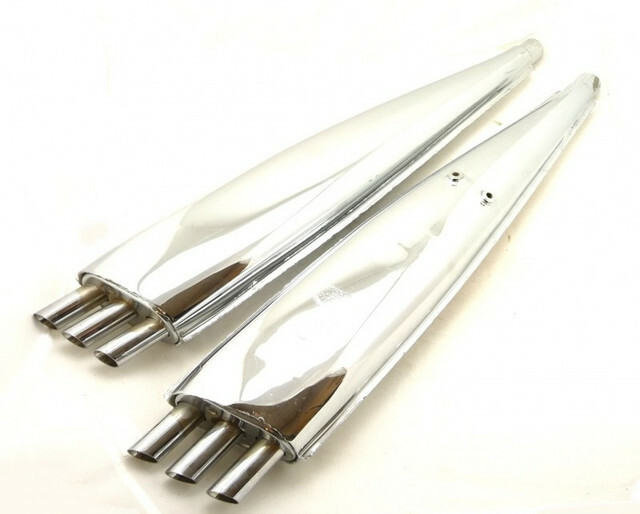 I don't care for the mufflers...but then, I didn't like BSA's Ray Gun silencers, either. 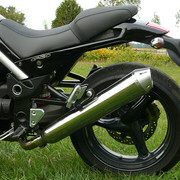 I think the stock Griso exhaust may be the ugliest stock exhaust ever installed on a motorcycle. Replaced it on both Grisos I have owned. Awesome responses! Some understand, some never will. It's just a matter of preference. Asymmetrical Design may not be for everyone, but there are countless examples of the beauty in this. And some people will continue to say WTF? It does meet some 'transformer' design requirements. BTW: Is it true the oil cooler rides as a balance weight to that freak show out back? Just wondering. 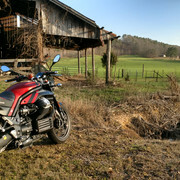 A stock GRiSO does seem to have a polarizing effect on the discriminating "Guzzi Faithful". "Holy sh!t, that thing is sweet!". Predictably the next comment is "Who makes it?" I don't know about any of that other stuff, but I do agree with Dolly.